Efficient & precise, the new Philips Beard Trimmer is a stylish instrument for shaving which keeps you ready before time for every important event in your life. 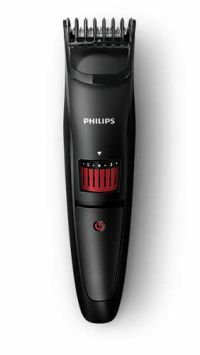 Philips QT4001/15 Trimmer Efficient & precise, the new Philips Beard Trimmer is a stylish instrument for shaving which keeps you ready before time for every important event in your life. 1mm precision settings beard trimmer Style your beard the way you want with this beard trimmer. Precision from as short as 1mm up to 10mm. stay extra-sharp to always cut hairs neatly and effectively, but have rounded blade tips and combs to prevent irritation. to hold and use, it’s designed to help you trim those hard-to-reach areas. To Recieve updates and possible rewards for Philips QT4001/15 please sign in. To Recieve updates and possible rewards for Trimmer, Clipper & Shaver please sign in.